You must build your project before you can create a launch configuration. In the Project Explorer view, right-click a project and select either Debug As or Run As, then click C/C++ QNX Application. In the Name field at the top, type a name for the launch configuration. In the Main tab, click the Build configuration dropdown and select the build configuration to use. You can view the build configuration options for your project by right-clicking it and selecting Build Configurations > Set Active. The build configuration determines how the binary file is packaged and what type of target it will run on. In the Target Options panel on the Main tab, select your target. 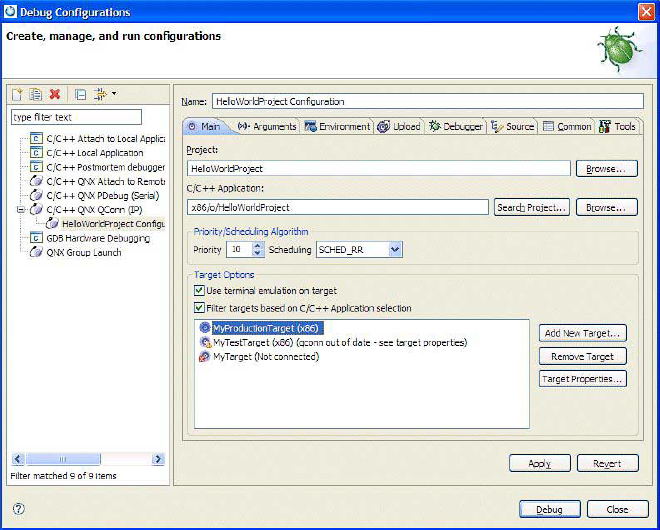 If necessary, you can create a target by clicking Add New Target..., filling in the connection fields in the resulting dialog, and then clicking Finish to save the new target information. The launch configuration is now listed in the Run Configurations and Debug Configurations dialog. By default, the project is associated with this new launch configuration. You can run or debug the project simply by clicking Run or Debug in the bottom right corner. When finished, click OK to close the dialog. Note: At any time, you can access and edit the launch configuration by right-clicking your project and choosing Run As > Run Configurations or Debug As > Debug Configurations from the context menu, then selecting the launch configuration in the left-side navigation pane.